That'll probably be my luck too. Let me know if you find some and I will do the same. Maybe they are available new from the dealer or something. I just checked all the usual places on EBay Motors and came up dry this time around. But, if we all check at least once per week one will come up for sale. Keep the thread alive as a reminder to me and others to take a look when they can and I'm sure we will find a couple of them. This pan is stought and is cast with a lot of reinforcing ribs as well as having threaded boss that is used for a motor mount on certain models. So the answer is Yes you can jack up on the pan within reason. Especially to do the belt change. I will still use a piece of wood to distribute the load, out of habit, but would not worry at all if I didn't have a piece of wood handy. Good idea! Thanks rick for looking out for all of us Riviera enthusiasts. Which thread are we using, this one? Or the one further down the page titled: Oil Pan Cooler.? Don't quite know how oil pan cooler came about, but it is still being used. I don't know but I'm only posting here. What's a aluminum oil pan cooler anyway??? NO CLUE, I think it was a misprint from some time ago and it keeps getting pulled up when you do a query of Aluminum Oil Pan. You're right Rick. I just read both and they're about the exact same topic. They need to be merged together to eliminate confusion. Its basically the same subject in two different threads. Will do. I'm gonna try and see if I can find it retail somewhere too. If you should read this could you somehow merge what is being written here withe the thread titled "Aluminum Oil Pan Cooler"
Don't quite know what an Aluminum Oil Pan Cooler is, but the subject matter of changing to an aluminum oil pan is the same in both threads. Try this as the final solution. This has turned out be the best mod I have done yet. Especially for the amount of money. Solved all leaks and seeps. Is completely dry under the car now. I got the complete setup off ebay for $50.00 shipped and that included the proper pick up tube and a tube of the proper GM sealant. Pan was cleaned and ready for install. I think I got lucky, but billboost tells me they are available all the time on ebay. So, if you have a little time to wait, try and find the aluminum one that doesn't require a gasket, only sealant, or the other one that has an O=Ring type seal instead of sealant. Both don't leak. Make sure it comes with the oil pump pick up tube though, as they are different, because the windage tray is built into the aluminum oil pan. 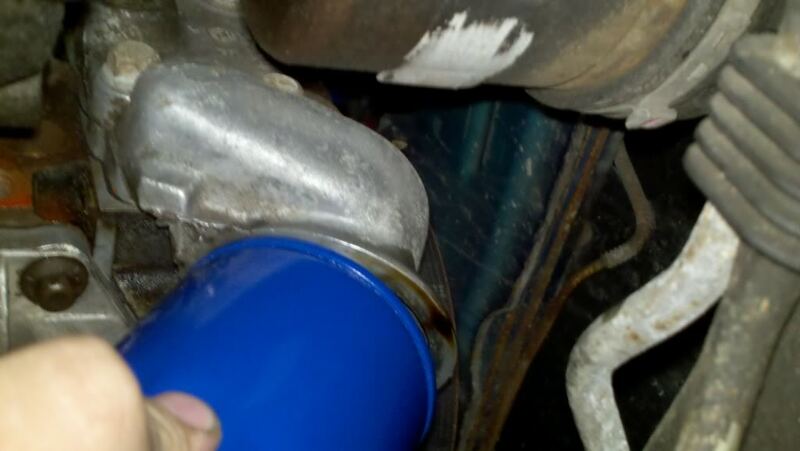 Prior to me installing this new oil pan I had installed new gaskets/seals on the tin pan twice over the course of a year trying to solve the problem, then Bill told me about the aluminum solution and I am so glad he did. I just bought a pan and pickup to replace the leaky steel one on my Riv. 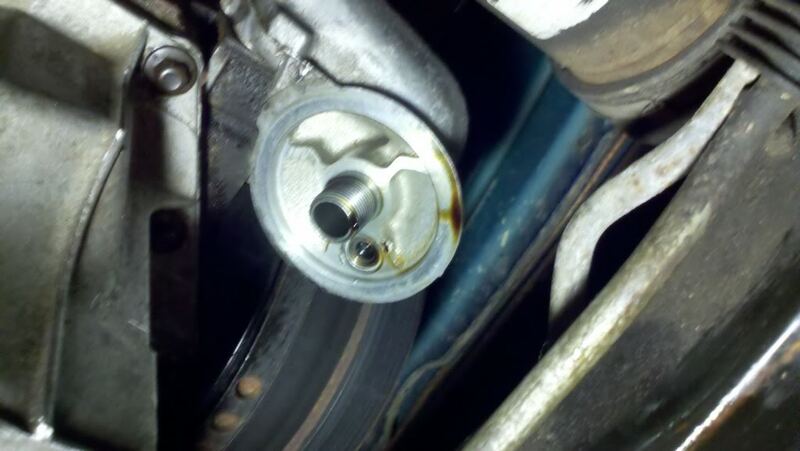 I ran into a problem though, I can't get the oil filter on now! Theres not enough room to get in there. 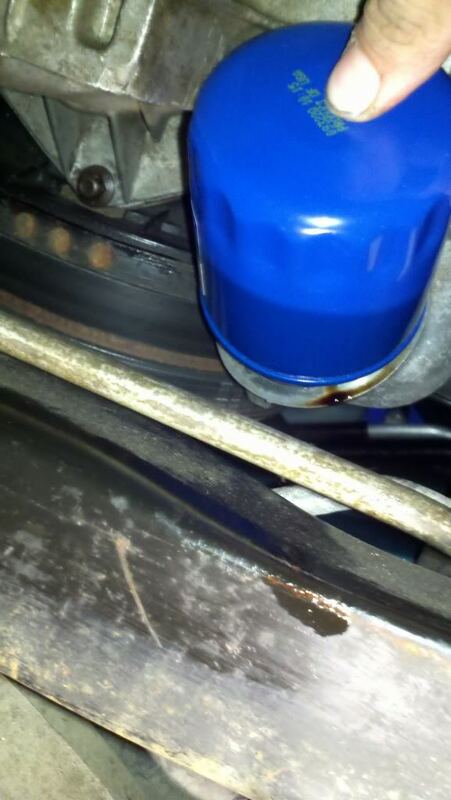 Did you have to replace the oil filter adapter too? Also a minor thing, but the plastic flywheel cover won't fit without some modding. I did not experience any troubles at all when installing the Aluminum pan that I got. I do not know from what year or model it was from, unfortunately. The Ebay site it was being sold on was forwarded to me at the time by Bill Boost and I just clicked the Buy it Now option and installed it with no problems. Sorry I can't be of more help. I looked at my records for that transaction and it does not list the year and model, it was advertised as a GM Aluminum oil pan for a 3800 engine only. Bill must have known from looking at the pic's that it would work or I just got lucky. You may have to swap the oil filter adapter as well, but I'm not sure of the fitment on that either. If it is available to you, you might have to try it or try swapping pans with a different model and year. Also, if you know how to get a hold of Bill from one of the other sites, he would be happy to answer any questions. He always is very helpful. I know he owns a forum, but don't remember the name of it. Maybe deekster_caddy (Derek) will have the contact info for him. They did a lot of business together at one time and maybe still do. AA might know what forum he owns and the other forums he frequents. It is aluminum and was an exact fit. No problems with the oil filter or flywheel cover. It doesn't come with the windage tray or pick up tube, but it comes with the oil level sensor. The pic of that one looks like a stamped steel one, but as you say is aluminum. Is it a heavy cast aluminum like the OEM ones or is it a stamped from aluminum sheet.? Just curious. The price seems fair for new, but it still requires you to use the stock gasket / seal for it.? Did you buy this pan locally at a junk yard or did you buy it off the web.? The reason I ask is, if you bought it locally you have a good chance of getting it replaced with a different one now that you know what you need and/or getting the oil filter adapter for the 00 Bonny and try that. p.s. I do know that the Bonney's and the Grand Am's and Grand Prix's oil filters are at a different angle than the Riv's. The Riv's are made such that our oil filters screw on in a more vertical fashion and the other's are more of a 45* angle. Otherwise they take the same filter and should work for you with no problems if you have to install the Bonney filter adapter.. It was heavier than the original, so I assumed it was aluminum, because I didn't think that a steel one was available, but now that you mention it, it might have been steel. And yes the stock gasket works with it. EDIT: Looking at pic on page two, I'm pretty sure that the one I installed was aluminum, because the walls on that one look way thicker. Mine looks just like the one Bill posted on page 2. I bought mine off ebay a few months ago, but finally got around to the install today (I was due for an oil change). At first I thought it was just the delco PF52 filter that wouldn't fit, but the one that actually goes on our cars won't fit either. I wonder if GM changed the position of the adapter for 98? Not that I know of. The adapters were all the same. I think it is more likely that you put on a Bonneville pan and you may have to put on a Bonneville filter adapter for the Riv. Remember that Bill recommends things sometimes and he's not thinking Riviera, he is thinking 3800 and what he works on all the time. Most all of his customers and friends drive anything but a G body. So I think I just got lucky with mine just happening to be a direct fit. I could have just as easily bought the one you have and would have gone through exactly what your dealing with. If you can find a Bonney adapter or find Bill's number or a way to get a hold of him, he may have one laying around from a blown engine swap. He does a lot of that work on the side, nights and weekends he is always working on something. Other than the now known problem of the filter adapter not being correct for a Bonneville pan. I didn't have that problem but I think based on what has been experienced here lately we should probably add that part to the list of what's needed to do a swap easily. 4. Sealant or seal, depending on which pan you get (maybe the pans that require sealant only don't need a oil filter adapter, but I'm not willing to say that for sure anymore. It will take at least one more person with that type of pan and the time to document install to know. 5. Don't break your oil level sensor or else you'll be needing one of those. 6. Possible simple modification to trans splash shield, depending on pan installed. You can't look at the pans on page 2 and compare. The Cast Aluminum pans on page 2 will be thicker and heavier due to the fact that they are cast as opposed to stamped sheet metal or even stamped sheet aluminum. The fact that it doesn't have the windage tray installed in the pan indicates that it is not the same as an OEM aluminum one. But it has been stamped out of either material to match the stock stamped steel OEM one that doesn't have the windage tray built in and requires the OEM type gasket that has the windage tray. Either way it is a good replacement for a damaged and leaking steel oil pan on the Riv. and is priced right for something new and flat, not warped and leaking. Another thought comes to mind. Did GM change the 3800 design much over the years? My 87 lesabre has a steel pan with a built in windage tray and uses a rubber seal. I have never had a leak on that car. I wonder if that pan would fit on the rivs. The only thing that would need to be modded would be the oil level sensor, as that car didn't come with one. Can anyone say for sure if the aluminum oil pan will fit a 1995 series 1? I went through the thread but could not find if it was so.the series 1 and the series 2 have the same block right?? ?